By providing the capability to integrate data and services from multiple sources, ArcGIS 9.3 augments the use of spatial analysis throughout the enterprise. Using the Web, mobile devices, and desktop applications, the power of GIS can be pushed out to people who may not even be aware they are using GIS. ArcGIS 9.3 will make it possible for GIS users to do mashups using ArcGIS Server technology. 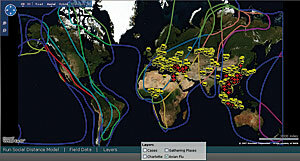 In this example, Microsoft Virtual Earth is combined with content and capabilities served from ArcGIS Server to create a customized view of avian flu outbreaks and migratory bird routes around the world. All the products within the ArcGIS family are built on a common architecture. This makes it easier for people across the enterprise to work from a common operating picture. Data and services are managed centrally but shared with others in a form that suits their workflows. Sophisticated models can be built using ArcGIS Desktop and served to end users via ArcGIS Server in the form of a simple Web application. The end user then sees the results, whether on the desktop, through the Web, or in the field. In this way, all the power of geospatial analysis can be made available to any employee within the organization or outside the organization if needed. With a common enterprise GIS platform, if someone in the field makes an edit to the database, the rest of the organization is able to view information that reflects that edit. Therefore, everyone in the organization has access to the most current data in near real time. These edits are still subject to the scrutiny of the administrators of the GIS, and ArcGIS 9.3 adds even more options for managing security to ensure the integrity of the enterprise GIS. 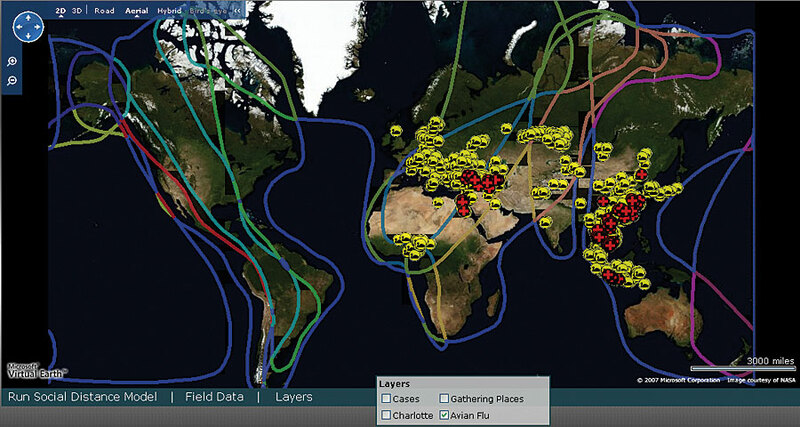 One of the most powerful tools GIS professionals have is the ability to create models. Modeling capabilities in ArcGIS allow GIS professionals to run what-if scenarios that lead to informed decision making about everything from where to stage firefighters during a windstorm to identifying areas potentially affected by an oil spill to locating a housing tract so that it is not subject to flooding. In ArcGIS 9.3, the modeling tools that come with ArcGIS are more sophisticated, with geostatistical error tracking, allowing for even greater confidence in analysis results, potentially saving organizations from making costly mistakes. Other important enhancements of ArcGIS 9.3 will include an out-of-the-box mobile editing application to better help field staff participate in a common operating picture; additional platform support; improved ways of managing Web security; and expanded support for Open Geospatial Consortium, Inc. (OGC), and ISO standards to continue to improve the interoperability of ArcGIS with other enterprise systems. For more information about ArcGIS, visit www.esri.com/whatscoming. Also read "What's New in ArcGIS Desktop 9.3."